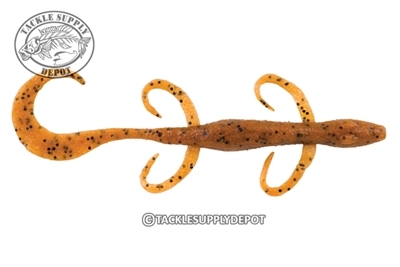 An old standby with an updated design; the Berkley Powerbait MaxScent Lizard takes the time tested lizard profile and pairs it with the MaxScent flavoring and color schemes. Deadly on a Carolina rig and around bedding bass the Berkley Powerbait MaxScent Lizard is also ideal on a shaky head, as trailer bait or flipped in and around cover. The Berkley Powerbait MaxScent formula disperses around the lure causing a scent field that draws hungry predators in and the color schemes offer a natural appearance. Berkley Powerbait MaxScent offers a durable construction yet maintains a soft feel that provides lifelike action and translates to better hook ups. Found these work great for c-rig!